Don’t wait until right before the end-of-year STAAR or other state assessment to get your students ready for the test! 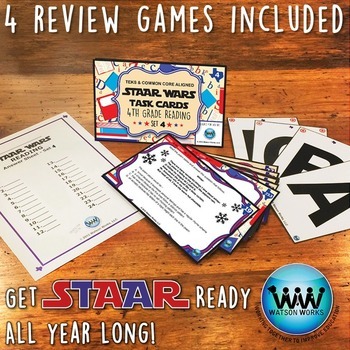 Prepare them each 6 weeks of school with our STAAR Wars 4th Grade Reading Task Cards! 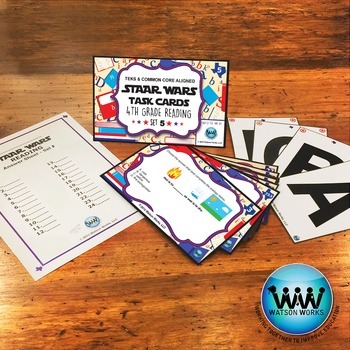 Each set includes 24 task cards aligned with 4th grade reading TEKS and common core standards and are perfect for assessing where your students are and where you need to go for the next 6 weeks of school. Follow us on TpT, Facebook, Instagram and/or Pinterest to be alerted when additional products and sales are available! **You may also like our 4th Grade Writing or 4th Grade Math Growing Bundles, as well! © 2015 Watson Works, LLC. Except as permitted under the United States Copyright Act, no part of this publication may be reproduced, stored, or distributed in any form or by any means (mechanically, electronically, recording, etc.) without the prior written consent of Watson Works, LLC. Purchasing this product in digital form from the Watson Works store on TeachersPayTeachers.com licenses one teacher to use this product in his/her classroom or for personal use. Additional licenses must be purchased for additional teachers to use this product. Made in the USA. All rights reserved.